Show that special person you care, er, more than words can say. Give their writing a hearty shove in the right direction with a thorough and empowering screenplay or pilot analysis from Coverage Ink, the industry experts. We’ll help figure out what’s gone right and what needs some TLC and help put your friend or loved one gently but firmly back on track. 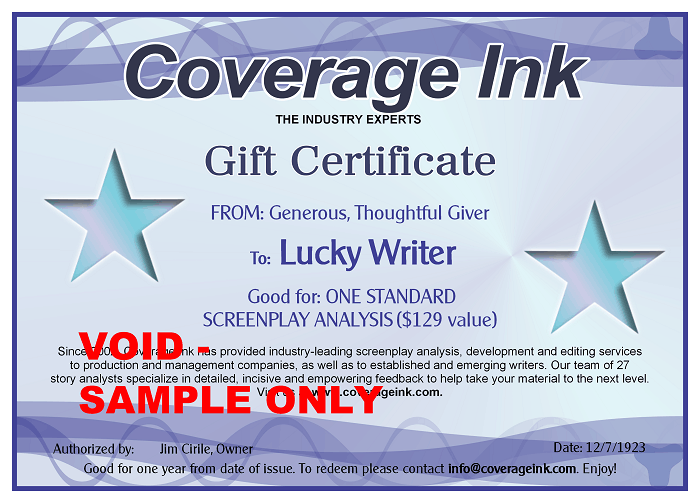 Pick up a lovely Coverage Ink gift certificate today! Just e-mail us and tell us the TO and FROM and the amount desired. We’ll get back to you straight away. Gift Certificates are generally delivered via e-mail within 24 hours or less!